Megan Baer is an Associate on the Executive Search team in the El Segundo office. She brings more than 5-plus years experience recruiting in the LA market, and has a proven track record locating, identifying and closing the region's best talent. Prior to Century Group, Megan was a top recruiter for two national staffing firms — achieving the President's Club Award and other recognition for her continued success. Megan has her Bachelor's degree in Business Management from the University of California, Santa Cruz. Catherine Bewley is a Director for Client Services on the Project and Interim Services team in the Glendale office. In that role, she utilizes her extensive background in the staffing industry to help clients identify key projects and fill interim roles on their accounting and finance teams. Catherine has more than 15 years of experience in both recruiting and client development, including roles at a number of national staffing firms. She prides herself in bringing a high level of quality and significant value as she works with each client on their individual needs. Michelle Cafagna is an Associate Director of Client Services on the Project and Interim Services team in the Walnut Creek office. She uses her experience in the staffing industry to create strong client relationships and connect them with top candidates. Prior to Century Group, Michelle worked as a recruiter’s assistant at a national staffing firm — supporting her team by consistently surpassing individual metrics. There, she also helped develop new candidate and client leads, performed pre-interviews and executed other key industry practices. Michelle holds a Bachelor’s degree in Communication from Saint Mary's College. Valerie is an Associate Director of Client Services in the Walnut Creek office, and uses her sales background to develop strong relationships with clients. Prior to joining Century Group, Valerie was a successful Outside Sales Account Executive at a national technology company. There, she had a proven track record for finding challenges within an organization — partnering with C-Level executives to create long-lasting solutions. Valerie has a Bachelor’s Degree in Politics from the University of California, Santa Cruz. Bobby Diloy is an Associate Director on the Executive Search team in the Walnut Creek Office. He joins Century Group with extensive recruiting experience in finance and accounting, and a strong ability to develop relationships with both clients and candidates in the Bay Area market. Prior to Century Group, Bobby was a top producer at several global and national staffing firms. He also worked in the financial services sector —holding management positions in banking, operational audit, commercial finance treasury and credit, and AML and BSA risk management. Bobby earned a Bachelor’s degree in Business Management from Concordia University and a Master’s degree in Business Management with an emphasis in Business Continuity, Security and Risk Management from Boston University. Madison Garshman is an Associate Director of Client Services on the Interim and Project Services team in the Glendale office. She works with Accounting and Finance candidates to identify their next great career opportunity, and believes the key to finding the right candidate is matching the interests of the client to the goals of the candidate. Sean Gilmore is a Senior Associate on the Executive Search team in the Denver office. For the past three years, he's worked in the Denver market helping both clients and candidates across multiple industries, including oil and gas, technology, homebuilding and retail. Prior to his move back to Colorado, Sean was with Century Group's Executive Search team in the El Segundo office. He holds a Bachelor's degree in Political Science from California State University, Northridge. Deanna Gutman has more than 10 years of recruiting experience in the Accounting/Finance arena. She has been a top producer for many years and has made hundreds of successful matches within Fortune 100/500 companies. Prior to recruiting, she worked as an Auditor at Arthur Andersen. She earned her Bachelor's degrees in Business-Economics with an emphasis in Accounting, and Slavic Languages and Literature from the University of California, Santa Barbara. Madina Hamid is a Senior Associate on the Executive Search team in the Los Angeles office, and works with accounting and finance professionals in various industries. Madina uses her client-relations background to help finance and accounting professionals in their search for career opportunities. Prior to Century Group, Madina spent many years as a top-producer with several Fortune 500 retailers in the Bay Area, during which she developed a large customer base due to a solid client-relations ability. Madina holds a Bachelor's degree in Psychology and Social Behavior from the University of California, Irvine. Alec Henricksen is an Associate Director of Recruiting on the Interim and Project Services team in the Glendale office. His primary goal is to assist talented accounting and finance professionals in finding great careers, and firmly believes employees are the most valuable assent an organization can have. Prior to Century Group, Alec handled recruiting for various Accounting and Finance roles at another competitive staffing firm. He also has experience working in the banking and retail industries, providing clients with excellent customer service. Alec earne his Bachelor’s degree in Business Management at Metropolitan State University of Denver. Gabrielle is An Associate Director of Recruiting on the Project and Interim Services team in the Walnut Creek office. She uses her recruiting background to help accounting and finance professionals in their career search. Prior to Century Group, Gabrielle worked at two national staffing firms where she developed strong client-relations skills and an inventory of high-level candidates. She regularly exceeded performance standards, even earning two promotions for her efforts within her first year at the most recent company. Gabrielle holds a Bachelor of Science degree in Business Management from Sonoma State University. Wade is an Associate Director of Client Services on the Project and Interim Services team in the Westlake Village office. With more than six years of sales experience, he prides himself on developing long-lasting relationships with clients. Prior to Century Group, Wade was a District Manager for a boutique video agency — quarterbacking all sales processes and establishing innovative ways to grow the business. He consistently found success by bringing on some of the company’s largest clients, which allowed him to work alongside executives at several Fortune 500 companies. Wade received his Bachelor’s degree in Psychology from California State University, Northridge. Chantel LeBoff Greene is a Director of Recruiting for Century Group's Project and Interim Services practice in the Los Angeles Office. A Certified Staffing Professional®, she focuses on recruiting and deploying professionals on project and interim engagements across a range of functional areas, including financial executives; controllership services; corporate finance; accounting and reporting; and internal audit, tax, and IT audit. Prior to joining Century Group, Chantel was in the Business Risk Services practice at Ernst & Young for six years. Her clients included Fortune 500 companies in the entertainment, media, manufacturing, retail, and managed health care industries. During her internal audit career, she provided expertise in risk assessments, risks and control reviews, compliance, minimum control standards, and industry best practices. She was also responsible for a $30 billion revenue company’s organization-wide controls program. Her strengths included developing and maintaining productive relationships with clients with a commitment to client satisfaction. She holds a Bachelor's of Science Degree in Business Administration, with emphases in Finance and Information Systems, from the University of Southern California. Arielle LeBoulch Share is a Director of Client Services on the Project and Interim Services team. A Certified Staffing Professional®, she partners with clients to provide them with top talent for project and interim engagements in finance and accounting. Her aptitude for understanding a client’s unique needs has allowed her to successfully complete searches for such roles as Corporate Finance Director, Controller, Reporting Manager, Senior Accountant, and Senior Analyst, as well as roles in internal audit and tax. Arielle began her career as a top sales associate for a large recruiting firm in New York City, where she worked with middle market and Fortune 500 clients in financial services, media, entertainment, retail, real estate, and private equity. She earned her bachelor's degree from Florida State University. Eric is an Associate Director of Recruiting on the Project and Interim Services team in the Westlake Village office. A trained recruiting professional, he uses his experience to find the right people the right job. Prior to Century Group, Eric worked at two national staffing firms where he placed high-level technology and accounting and finance professionals. He earned a RightSkill Certificate of Achievement and was recognized as a $100K Perm Biller after his first full calendar year with the most recent company. Eric holds a Bachelor of Arts degree in Public Relations from the University of South Carolina. Colin is a Director of Client Services on the Interim & Project Services team in the El Segundo office. He brings five years of staffing and consulting experience working with a range of clients from high-growth startups to Fortune 100 organizations. His philosophy is to invest the time and commitment necessary to truly understand his clients' business and organizational goals. Prior to Century Group, Colin held multiple roles at a national consulting firm — most recently serving as the Director of its LA Finance & Accounting practice. He played an instrumental role in building a best-in-class consulting practice in San Francisco before moving to Los Angeles. He was a two-time Gold Performer and President's Trip qualifier. Colin holds a Bachelor's Degree in Business Communications from Stevenson University in Baltimore. Sean Morley is an Associate Director of Recruiting on the Project and Interim Services team in the Orange County Office, where he uses his background and expertise to recruit consultants for roles in accounting, finance, tax and audit. Prior to joining Century Group, Sean worked on both the candidate and client-facing sides of the business. He previously worked for regional and national staffing firms, where he recruited temporary and direct hire candidates for accounting and finance roles. Prior to that, he was a top producer in sales with W.W. Grainger. He earned his Bachelor’s degree from Illinois State University. Prior to joining Century Group, Erik was a Branch Manager and top producer for Enterprise Rent-a-Car, improving performance, sales and training during his tenure. He also served as an Executive Branch Manager for National Services Group, where he hired and supervised a team, maintained a high customer satisfaction rating, and increased both revenue and profit. He earned his Bachelor's degrees in Finance and Marketing from the School of Business Administration at Loyola University-Chicago. 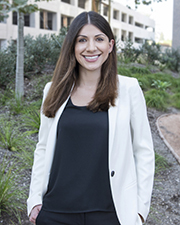 Lisette Neira is an Associate Director of Client Services on the Project and Interim Services team in the Costa Mesa office. She joins Century Group with 2-years experience working at a national accounting and finance staffing firm, and helped to place the right candidates for every client in the Orange County marketplace. She was recognized as the No. 1 Top Performer for best year-over-year growth in 2017 among 500 employees in the nation — illustrating Lisette's expertise in client relations and ensuring expectations are met on both sides. Prior to staffing, Lisette was a Director of Career Services in the education industry, where she provided students with coaching and interview techniques. She earned her Bachelor's degree from California State University, Long Beach. Peter Nelson is the Managing Director of Century Group's Denver, Colorado office. In this role, he provides mentorship to team members, strengthens client relationships and identifies new business opportunities. Prior to that, Peter acted as Director, Executive Search at the firm's El Segundo office — managing and completing searches in the entertainment, engineering, technology, real estate, legal and service industries. He's successfully placed professionals at the CEO, CFO, Vice President, Controller and Management levels within Finance, Accounting, Tax and Audit. Brandon Schlig is an Associate on the Executive Search team in the Glendale office. Brandon focuses on the recruitment and placement of professionals for accounting and finance roles, and enjoys helping people reach the next stage in their careers. Nijal Shah is a Director on the Interim & Project Services team in the Westlake Village office. She focuses on recruiting and deploying professionals on project and interim engagements across a range of functional areas, including financial executives, controllership services, corporate finance, accounting and reporting, and internal audit, tax and IT audit. Carolyn Sweeney is the Managing Director of Century Group's Walnut Creek, California office. During the course of her career, she's filled over a thousand direct hire searches and temporary assignments for leading Bay Area companies and is known for her deep network, professionalism and for building award-winning teams. She has been recognized as Partner of the Year by the FPA of the East Bay for her contributions to the business community and is presently the acting President for the Accounting and Finance Women's Alliance, where she's served on the board and has been an active member for more than 10 years. Carolyn also enjoys being involved with her children's school and her Saint Mary’s College alumni community. Monica is an Associate Director on the Executive Search team in the Westlake Village office. She uses her extensive recruiting experience to help accounting and finance professionals achieve their career goals and prides herself on a customized client experience. Prior to Century Group, Monica spent 15 years with a national staffing firm working in roles of increasing responsibility across both Temporary and Permanent placement services. She also traveled the country as an internal Training and Development Manager for three years — facilitating recruiting and sales trainings for more than 30 offices in North America. Monica’s received several top achievement awards for her success in the industry, including ranking No. 1 in placements and revenue in multiple markets. She holds a Bachelor’s degree from California State University Northridge in Psychology, and earned her Master’s Degree in Social Psychology at San Francisco State University. Lizzie Vogel is an Associate Director of Client Services on the Project and Interim Services team in the Glendale Office. She understands the importance of devoting her time to listening to clients, so she can provide the best solution for their business and help with accomplishing their goals. Prior to Century Group, Lizzie worked at Enterprise Rent-A -Car as a Branch Manager. While there, she was able to increase her corporate referral business — resulting in office growth of 12% and multiple customer service awards. Lizzie holds a Bachelor's degree in Communication with an emphasis in Business Management from California State University, Long Beach. Prior to joining Century Group, Barnaby worked at two international publicly-traded staffing firms in three major metropolitan markets: Orange County, Los Angeles, and San Francisco. He has been actively involved with the Orange County Chapter of the Institute of Internal Auditors (IIA) since 2011, including serving as Programs Chairman. He earned his Bachelor's degree in Psychology from the University of California, Los Angeles and is actively involved with the local alumni group, OC Bruins, currently serving as President. Matt Wethington brings more than 17 years of executive search experience to his client engagements. He joined Century Group as an Associate in 2000 and quickly established himself in the field, achieving successive promotions to his current role as Senior Director. Since transitioning into executive search, he has consistently been a top producer, successfully executing numerous finance and accounting searches in a variety of industries, including entertainment, pharmaceuticals, technology, automotive, financial services and consumer products. Prior to joining Century Group, Matt worked in corporate financial planning and analysis for two Fortune 500 companies, IBM and Hewlett-Packard. He earned his Bachelor's degree in international business from Pepperdine University and his MBA in finance from Thunderbird School of Global Management. Jordan Wood is a Director for Client Services on the Project and Interim Services team in the Orange County office. In that role, he uses his background and expertise to help clients identify key projects and fill interim roles in the areas of accounting, finance, tax and audit. Prior to joining Century Group, Jordan worked for a regional staffing firm, where he worked on both temporary and direct hire roles in finance and accounting, human resources, and IT, among other areas. Prior to that, he was an Assistant Buyer for Tilly’s and Zumiez. Jordan earned his Bachelor’s degree in Business Administration, Marketing from Western Washington University. James is an Associate on the Executive Search team in the Westlake Village office. A CPA, he uses his accounting background to successfully place accounting and finance professionals into new opportunities that are the best fit for them. Prior to joining Century Group, James gained audit experience with KPMG and most recently worked as Tax Staff for EY. There, he performed tax real estate work on EY’s largest tax client, analyzed and solved technical tax issues and actively recruited top talent for the EY brand. James is a veteran of the U.S. Navy. He holds a Master of Professional Accountancy and Bachelor of Business Administration, Accounting from the University of Wisconsin-Whitewater.